Highly experienced and qualified bikepacking instructor accompanying you throughout the course. Two days bikepacking skills instruction in a small group, with the chance for one-to-one tuition, advice and support. Overnight wild camping mini-adventure in a beautiful secluded spot. All bikepacking luggage and Firepot evening meal included. Bunkhouse accommodation at our base in the Hope Valley is available for the night before. What has come along more recently is lots of nice lightweight stuff that allows you to be self supported whilst still having a bike that’s enjoyable to ride. As such it lends itself to micro-adventures in off-road mountain bike touring or fast and light road touring. The beauty of bikepacking is that you can do it anywhere, even riding straight out of your own back door you’re likely to have an adventure finding things you never knew were there. A bicycle and a few bits of kit is all you need for short escape where you’ll go and have fun riding your bike then sleep out under the stars. We reckon it’s the perfect antidote to the stresses of ‘modern life’. We’ll do a two day instructional experience, as a group, to show you all the basics you need to know so that then it’s easy for you to get out and have your own adventures. We’ll kit you out with all the bikepacking luggage you need to carry your stuff on your bike. If required you can also hire a bike and camping equipment from our adventure hire fleet. Alternatively, you’re welcome to bring your own bike and/or equipment. We’ll first spend a bit of classroom time on what to take, how to plan and how to get things ready but then we’ll learn by doing; heading off the beaten track on a guided overnight bikepacking adventure in the wilds of the Peak District National Park, covering all the stuff you need to know along the way. All you’ll need to bring is a suitable sleeping bag and bags of enthusiasm! Our Adventure Bunkhouse at our base in the Hope Valley is available for convenient accommodation the night before the course for just £25 per bed (mixed dorm). If you’re traveling by train, we’ll deliver your bike to Hope Station (just 2km down the road) and transport your luggage back to base FOC. Within easy walking distance of local pubs and restaurants it’s a great way to explore our beautiful setting and be well rested and prepared for the course starting the following morning. In the morning you'll meet Pete to go through kit, what to take, how to pack the bike, basic bike maintenance, and route planning. You'll then head out into the Peak District at a gentle pace with plenty of stops - you'll spend the day riding off-road, going through skills and techniques before finishing up at a beautiful secluded wild camp spot in plenty of time to set up before it gets dark. After you've enjoyed a night sleeping under the stars, you'll pack up and slowly cycle back, enjoying the scenic views of the National Park along the way. There will be time to cover any other skills that you want to learn about and you can choose from an easy or more challenging routes back! No previous off-road cycling or mountain biking experience is necessary and only a moderate fitness level is required - but you will need to be happy cycling around 20-30 km per day and sleeping outside. You are welcome to bring your own bike and equipment or you can hire it all from us. All you need to bring is a sleeping bag and a sense of adventure - we can guarantee you'll have an amazing time and come away with skills, knowledge and excitement! Experienced and qualified bikepacking professional accompanying you throughout the course. Two days high-quality bikepacking instruction in a small group of 6, with the chance for one-to-one tuition, advice and support. 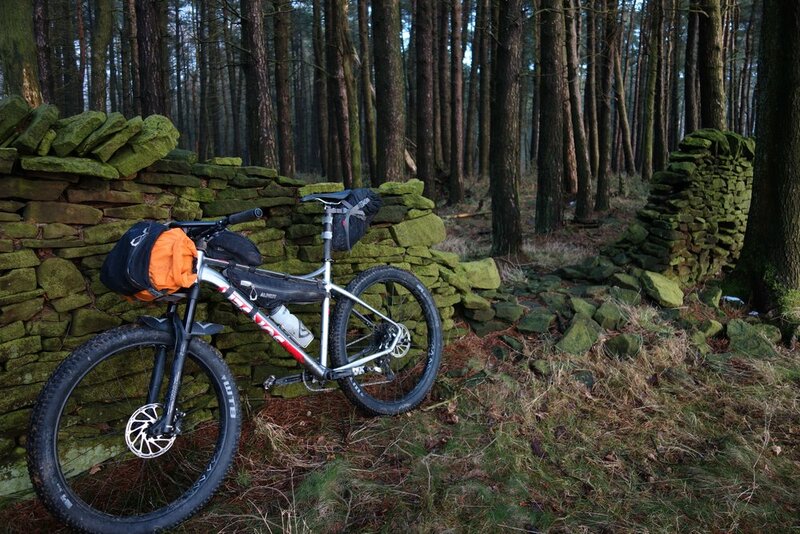 Full bikepacking luggage hire set up to suit your bike. Your choice of tasty Firepot evening meal. Bunkhouse Accomodation & train station pickup the night before the course - for an extra £25 why not come up the night before and make a weekend of it! Extra food and drinks - Bring along whatever snacks and breakfast you fancy for the weekend. You'll have the chance to pick up extra food from our favorite local produce shops on day 1, otherwise there’s usually limited opportunities along the way. Occasionally the the course will conclude with a cafe stop if the group is keen. Looking for accomodation the night before/after? Check out our Adventure Bunkhouse. The 2 day course costs £170 per person, plus any kit or bike hire required. July - 13th/14th - Last few spaces available! There is a maximum of 6 participants on this course, so book early to avoid disappointment!